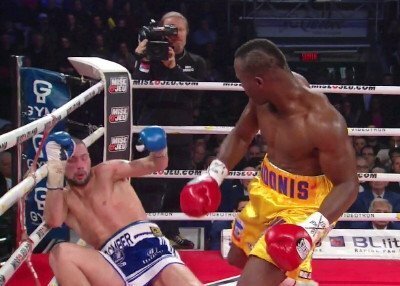 WBC light heavyweight champion Adonis Stevenson (23-1, 20 KO’s) hammered Tony Bellew (20-2-1, 12 KO’s) at will with power shots en route to stopping him in the 6th round tonight at the Colisee de Quebec, Quebec City, Quebec, Canada. The fight was embarrassingly one-sided from start to finish, and it probably would have been over much sooner if Bellew hadn’t moved as much as he did. In the 6th round, Stevenson hit Bellew with a big left to the head that sent him down on the canvas badly hurt. To Bellew’s credit he was able to staggered back to his feet, but Stevenson was on him right away in hitting him with a hard left hand that caused Bellew’s legs go stagger and look like noodles. Stevenson then hit a defenseless Bellew with two more left hands to the head that caused the referee to stop the fight to save Bellew from getting knocked down a 2nd time. In being interviewed by Max Kellerman of HBO after the fight, Stevenson said he wants “Carl Froch or Bernard Hopkins” next. Stevenson said he’s interested in fighting Sergey Kovalev if HBO puts the money up. But if they don’t, then he wants Froch or Kovalev. Froch already had the chance to fight Stevenson in the past when he was his mandatory challenger, but Froch chose not to do it. Would Froch want to fight Stevenson now? It’s doubtful, especially after how bad Froch looked against George Groves. In an impressive display of punching power, WBO light heavyweight champion Sergey Kovalev (23-0-1, 21 KO’s) totally blew away contender Ismayl Sillakh (21-2, 17 KO’s) in knocking him down twice en route to stooping him in the 2nd round. Kovalev hit Sillakh with a crunching right hand to the head that dropped him on his backside in the 2nd round. Sillakh was able to stagger to his feet, but Kovalev literally ran at him and tagged him with a right-left combination that dropped Sillakh hard on the canvas on his back. Referee Marlon Wright stopped the fight immediately at 0:50 of the round. Sillakh looked good in the 1st round when he was moving, throwing jabs and left hooks. Kovalev was loading up with big right hands and missing the target by a mile. It was definitely difficult for Kovalev in the opening, because Sillakh made him look slow-footed during that round. But in 2nd round, Kovalev was able to immediately put Sillakh on the canvas after he caught him near the ropes. Sillakh was really hurt by the knockdown, and he needed to clinch but he never got a chance to do that because he was hit immediately with a big right hand followed by a crunching left that collapsed Sillakh’s limp body on the canvas. Next boxing news: Adonis Stevenson – Fighter Of The Year for 2013?